NEW BRITAIN - The Human Resources Agency of New Britain gave out hundreds of turkeys Monday afternoon as part of its annual pre-Thanksgiving distribution. “We can’t even count the number of families that could benefit from this. It’s probably just the tip of the iceberg of families we can help, but, symbolically, I think it’s really important that we do this every year,” said Rocco Tricarico, the HRA’s executive director. This is the HRA’s eighth year of distributing turkeys to residents. Jason Jakubowski, president and CEO of Foodshare, said the organization collected 15,334 turkeys this year for distribution in Hartford and Tolland counties before Thanksgiving. In addition to turkeys, residents could pick up peas, refried beans, bread and other items for a Thanksgiving meal. 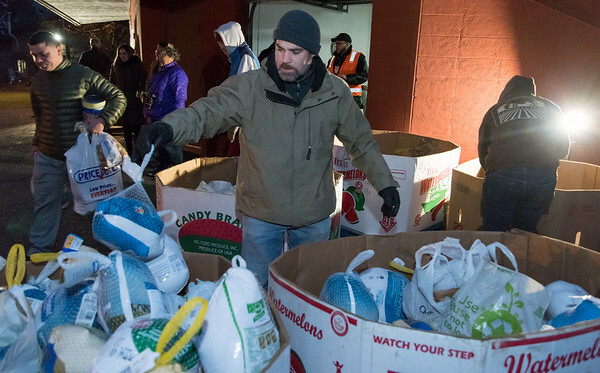 U.S. Sen. Chris Murphy, D-Conn., joined in on the distribution Monday, contributing a turkey of his own. Murphy said he hopes federal, state and city support helps keep the doors of organizations like the HRA open. “From the bottom of my heart, thank you,” Murphy said to volunteers helping with the food distribution. In total, the HRA of New Britain distributed 447 turkeys to people before Thanksgiving this year. Foodshare provided the turkeys to the HRA, but the organization also received some private donations. Most of the turkeys were distributed at the HRA’s New Britain Food and Resource Center on Osgood Avenue, but they were also given out at several of their other offices in the city. Established in 2009, the New Britain Food and Resource Center serves New Britain residents who live below the federal poverty level and receive food stamps through the Supplemental Nutrition Assistance Program. The HRA recently received funding from the American Savings Foundation, United Way of Central and Northeastern Connecticut, the Community Foundation of Greater New Britain and many private donors to help keep the pantry operating through December 2018. Skyler Frazer can be reached at 860-801-5087 or by email at sfrazer@centralctcommunications.com. Follow Skyler Frazer on Twitter @SFrazerNBH. Posted in New Britain Herald, General News, New Britain on Monday, 20 November 2017 23:04. Updated: Monday, 20 November 2017 23:06.